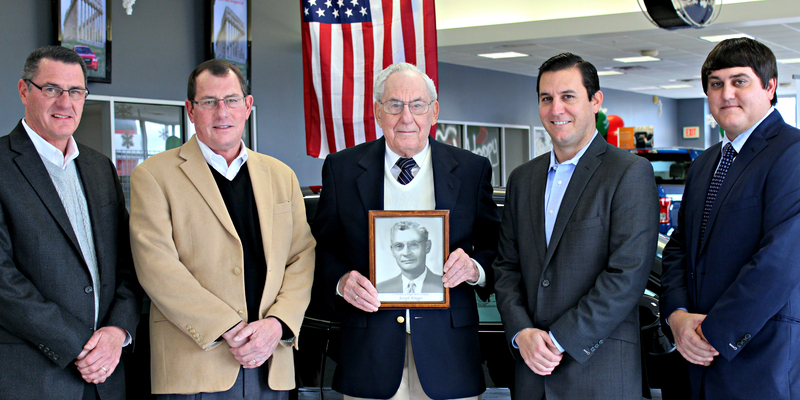 Krieger Auto started way back in the 1920's when two young automobile mechanics worked together at the local Ford dealer in Muscatine, Horst and Strieter. Joseph Krieger and Charles Henderson were the mechanics. Charles opened his own garage in 1931, known as Hendersons Garage in downtown Muscatine. Joe joined Charles in 1932 and they became equal partners in the garage. Soon after, Chevrolet stopped by the garage and asked them to take on Chevrolet, and as time went along during the 30's, the two partners acquired numerous other franchises, including Pontiac, Oldsmobile, and Cadillac. The original dealership operated out of a 3 story building, with service on the first floor, the second story was the showroom, and a body shop utilized the third floor. In 1951, General Motors wanted to separate the Pontiac - Cadillac franchise from Chevrolet and Oldsmobile. Marvin Krieger then designed a new building at the corner of Sycamore and Mississippi Drive that would house Henderson's Chevrolet - Oldsmobile. After a few tough years running the two garages together, they decided to go their separate ways, Henderson's Chevy Olds continued to run out of the new building and Kriegers Pontiac Cadillac out of the three story garage. The beginnings of Kriegers in 1956 were a tough going. A young Marvin Krieger struggled to operate the business. Marvin invested in hiring quality employees to help run the operation. Hiring great folks like Warren Tutt, Carson Schwandke, John Sprouse and Evie Lange, the business started to flourish. This started the principles of the "Krieger Way" of doing business.